and Jasper Schmidt (DAI Heidelberg) introduced the participants to the Begeisterhaus and the project leading there: “Road to__”. We also want to thank Sindbad for their yummie food! As part of the International Weeks Against Racism Heidelberg we organised a theatre workshop together with the Mehrgenerationenhaus Heidelberg that took place on March 16th. It was a great success with different perspectives, experiences and opinions on the topic of “human dignity”. Thank you to Mehrgenerationenhaus Heidelberg for the wonderful collaboration and to everyone who participated! How should I prepare for a job interview? What are common questions to be asked? How can I present myself in a convincing way? These questions were discussed during our workshop on job interviews “Bewerbungswerkstatt” last Saturday. The participants did not only get useful input on the topic but could also practice an actual job interview and receive feedback on their performance. Thank you to Bernd Nemetschek from “Leimen ist bunt e.V.” who lead the workshop and to everyone who came! We are proud and excited to introduce our new big project! Together with Asylarbeitskreis Heidelberg, Caritasverband Heidelberg e.V. and Diakonie Heidelberg, we are creating a brochure that gives an overview on all relevant offices, institutions, organisations and authorities for refugees and migrants that just arrived to Heidelberg. On February 13th a joint meeting of all cooperating partners took place to update eachother and agree on the next steps. Stay tuned! The project “H&M Meets the World Mannheim” is still ongoing. They met for example for a fun culinary afternoon on February 5th. The big closing event will take place on Thursday, April 11th – watch this space! We had a great time on January 11th at the Stipendiatentag of our Scholarship from startsocial e.V. in Berlin, where we attended very interesting workshops on impact measurement and strategic planning. We also had the chance to exchange with many wonderful social organizations from all over Germany. Thank you startsocial e.V. for this experience! Our event on job applications “Bewerbungswerkstatt” took place on Saturday, 15th of December. The participants had an interesting day about where and how to apply for jobs. They learned what important criteria to consider when writing a CV or a job letter and could work on their own documents. Thank you to Bernd Nemetschek from “Leimen ist bunt e.V.” who lead the workshop and to everyone that came! A special thanks to KochKultur for the great lunch! A school dress as a symbol for the experience of being abroad. Photographs that document a family history. A diary found on a beach in Lampedusa: Migration is accompanied and reflected by objects. On Saturday, 17. November we co-organised and hosted the workshop “Archives of Migration” by the department of Visual and Media Anthropology Heidelberg University at DAI Makerspace. Together with stakeholders from the the field of academics, arts and activism we discussed how such objects can be included and used to mediate migration experiences. The workshop was part of the kick-off conference for the Research Project “Entangled Histories of Art and Migration: Forms, Visibilities, Agents” It was a very interesting and fruitful day and we are looking forward to future collaborations! We are very happy to having been elected as one of 100 initiatives to receive a scholarship by startsocial! Startsocial is an annual contest that aims for a sustaining civil society by bringing it together with the economy. On Wednesday, 31. October, we went to the scholarship kick-off in Frankfurt. It was a great event where we got important information on the programme and already had a chance to meet other elected initiatives from the region. Starting in November, we will receive an individual coaching by experienced experts and management for a period of four months. Furthermore, we will become part of an extensive, Germany-wide network of social start-ups and initiatives. We are looking forward to this opportunity! Our 4th networking event took place on Monday, 22. October. It was a great evening with 18 initiatives dealing with migration in Heidelberg. During the event we talked about internal issues and strengths, the cooperation with the city of Heidelberg and if and how to enhance our political action. We were also really happy to welcome a representative of BASF that informed the participating initiatives about their funding opportunities. We really enjoyed the productive and positive atmosphere of the evening that was supported by the delicious food of one of our initiatives, KochKultur. Thank you to everyone that came! On 15. October we invited municipal stakeholders, initiatives and migrants to discuss “Refugees’ Housing Problems in Heidelberg.” We learned from personal experiences of discrimination, poor living conditions, and the many obstacles migrants face when looking for a new home. Following this event, we will become part of the Wohnraumbündis to represent the housing problems of migrants, prepare a statement explaining the difficult housing market for migrant and refugees, and we plan to spread awareness of ‘testing’ renters. More on this to come! On the 4th of July at migration Hub Heidelberg a presentation was given by Sophie, a longtime member of Migration Hub Heidelberg who is currently working in the public sector in the field of migration, more specifically refugee reception. Her talk shed light on the first few steps of the German asylum process. She focused on the structure of refugee reception in Baden-Württemberg and introduced the most important terms and definitions. We welcomed our friends from the Transatlantic Refugee Resettlement Network, and together we hosted this event, which took place at Migration Hub Heidelberg on the 15th of June, where field of urban housing and integration related programs and practices were discussed. The speakers of this events were: Sara Boughedir (Urban Development Specialist, Center for Mediterranean Integration), Christina West, PhD (Research Associate and Coordinator at the Urban Office at the Institute of Geography, Heidelberg University in Germany and Carrie Mann (Founder of Transatlantic Refugee Resettlement Network), and the talk was moderated by Ana Maria Alvarez Monge (CEO & Founder of MHN). The discussion was brought to a local level, we learned information about refugees’ living situation in the Middle East, and from Heidelberg: the challenges of integration in an urban society were discussed, particularly; how housing can be provided and why it is crucial to understand how we are living together. During the event, delicious Syrian food was provided by Sindbad (modern Syrian cuisine) one of our initiatives. We invited women of all backgrounds on the 17th – 18th of March 2018 in Mehrgenerationen Haus Heidelberg,with child care program included, to take part in a two days theater workshop. The weekend workshop with theater actress Ellen Muriel gave an opportunity for women with or without theater experience to come together, and to get to know each other and try something new. Through a combination of theater, music and dance we explored how we can use our bodies and voices to express ourselves, connect with other people and tell stories without language. Over the 2 days we tried theater games, movement improvisation exercises, body percussion and singing, and performed a small sharing at the end of what we’ve created. On the 8th of march we could -for the first time- take part in shaping global processes! 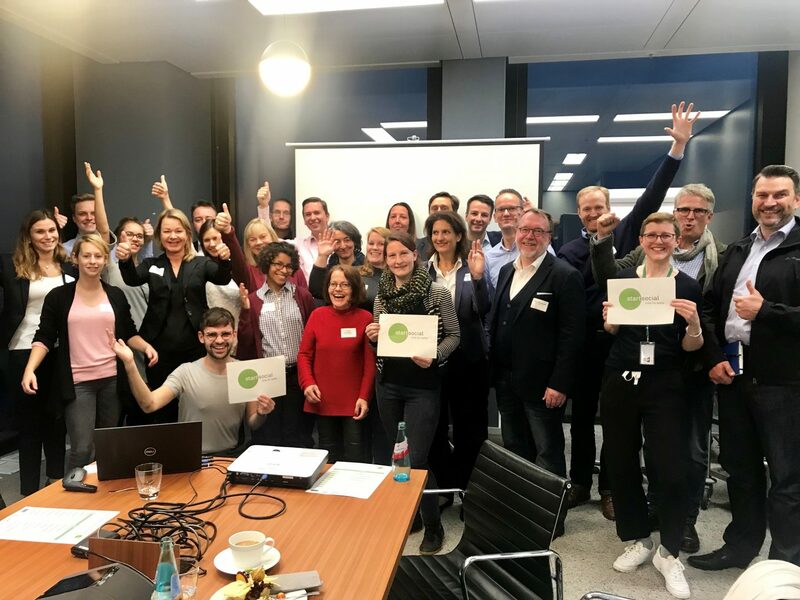 We were invited by the Bertelsmann Stiftung and Robert Bosch Stiftung to an exciting barcamp at Migration Hub Network Berlin with many of Germany’s active civil society in the field of migration and development. The focus was on the Global Compact for Migration and the Global Compact on Refugees. In the barcamps and workshops we worked on several impulses which were discussed with representatives of the german government on a panel at the end of the event. We met many different actors of the civil society and we had great ideas for future cooperation and projects together! After the well-received and filled to the last drop two performances of Ellens play “You, Me and the distance between us” in december of 2017, we brought her back for a two day theatre and Empowerment workshop as a part of the International Weeks against Racism Heidelberg. The captivating autobiographical one-woman show was created by the british actress based on her experiences of volunteering along Europe’s refugee route in Lesvos, Idomeni and Calais. She uses a unique blend of theatre, puppetry and song to bring to life the existential issues that surround the movement of people and encourages the audience to consider their own position within it. The workshop was an opportunity for women with or without theatre experience to come together. Through a combination of theatre, music and dance they explored how they can use their bodies and voices to express themselves, connect with other people and tell stories without language through theatre games, movement improvisation exercises, body percussion and singing. After a successful public crowdfunding campaign and through local sponsoring by Berlin hostels several volunteers of the Team Migration Hub Heidelberg and members of Heidelberg initiatives and organisations in the field of migration and refugee, could drive to Berlin for two days: To the Conference for Civil Empowerment: #InnovationKnowsNoBorders on the 21st of September 2017 at Migration Hub Berlin. The goal of the conference was to show the innovative power that comes with and lies in migration. The speakers of the 15-minute talks were social innovators and refugee entrepreneurs: Dashni Morad, Singer & Founder of Green Kids; Asem Hasna, 3D Printing Expert at Refugee Open Ware; Abdul Rahman Al Ashraf, Founder and CEO of FreeCom; Mohamed Jimale, Founder & CEO of Ari.farm; Nat Ware, Founder and Chairman of 180 Degrees Consulting; Fatuma Musa Afrah, Human rights activists & keynote speaker and Titus Molkenbur, Co-founder and Head of Operations at Jugend Rettet e.V. We were very inspired and thankful to attend such a diverse and uplifting conference full of motivated, compassionate and smart people. The KALEIDOSCOPE project was a three day audio drama writing workshop which took place on the 31st of March until the 2nd of April 2017 in Heidelberg. 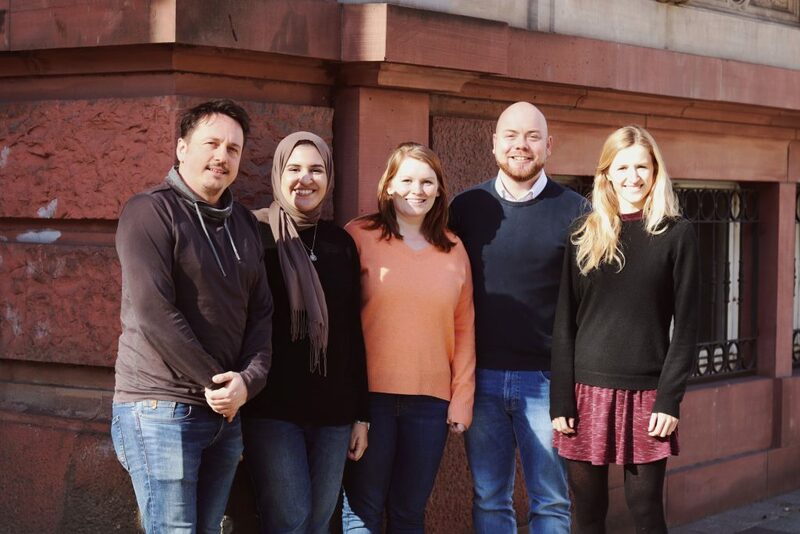 Migration Hub Heidelberg invited the KALEIDOSCOPE team to Heidelberg after meeting them in Berlin. We cooperated with William, Charlotte Stirling and Liz Rigby, the award-winning BBC radio writer and creator of the BBC’s Afghan radio drama. The project was backed by the UNHCR, UNWOMEN and OXFAM. The participants, 32 Syrian refugees and host community members from Heidelberg, created dramas that were artistically powerful and still educated people about what it means to be Syrian today. They learned how to write, create and present their stories and what has happened to them and their families in the form of 4 x 15 minute radio dramas in Arabic. Always a group of eight writer trainees worked on one script. The play was recorded and broadcasted on BBC in Arabic, and some in English and German, the Syrian radio station Radio SouriaLi and both English and Arabic radio stations in the Middle East.